The 10 Best Camping Spots in Indiana! A favorite pastime of Hoosiers is going camping. The Midwest has great atmosphere for camping, with its varied terrain of forests and beaches, lakes and meadows. Check out these 10 campgrounds for the next time you want to pitch a tent and build a campfire. Elkhart County, which borders Michigan, is a concentrated area of RV industry and Amish community. 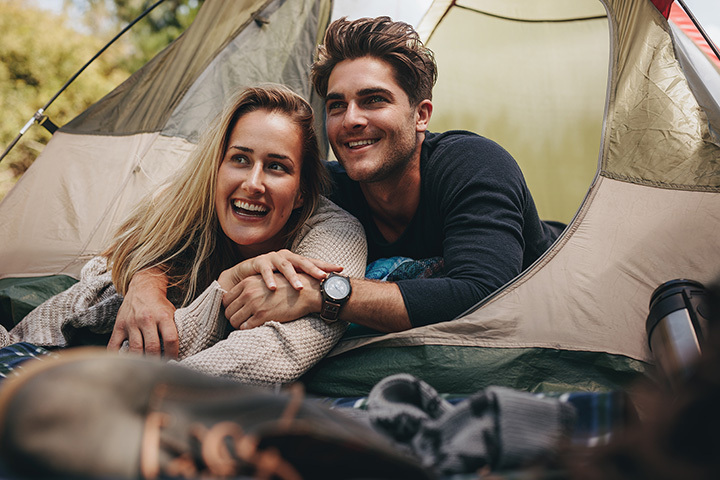 The Middlebury camp ground and RV park is centrally located between Middlebury and Shipshewana, offering more than just a night out in nature. Seasonally, the campground offers narrated tours through the Amish countryside as well as shuttle service to the Shipshewana Flea Market if your shopping itch needs to be scratched. As for the campground itself, RVs up to 80 feet with up to 50 amps are allowed, as well as your dog! There is a camping kitchen and Wi-Fi, propane and firewood at an additional cost, and a pool during summer. White River Campgrounds has something for every type of camper, whether you're a pop-up person, an RV enthusiast, or a tent tenant. You could beat your laundry on a rock in the nearby White River if you wanted to, but there is a laundry room with modern amenities. This quiet section of Hoosier nature is well suited for a relaxing day in a boat waiting for a tug on the end of your fishing line, and for walking or hiking through the beautiful forestry. With 106 sites altogether, White River Campground is a lovely destination for your next camping trip. Hardin Ridge Campground is a site of 200 lots on the shores of Lake Monroe, Indiana's largest lake. Hardin Ridge is so named because it is situated among the ridges of the southern part of the state (just southeast of Bloomington) which have the look and feel of a mountain ridge. Sites in the thick forest make your inner woodsman feel right at home, while sites near the lake's beach give your inner beach bum a cozy rug of sand to sink your toes in. There are also a couple of cabins to rent if you're just not in the mood for sleeping on the ground, but if you're willing to rough it just a little, campsites with electricity hookup, some with water too, are available. Turkey Run Campground at Turkey Run State Park is significantly larger than the grounds we've covered so far (pun slightly intended). All 213 camping spots for both RVs and tents are Class A, which means that there are flushing toilets and shower building nearby (as opposed to, say, within walking distance or even no plumbing at all as the letters go down the alphabet). For the adventurous youth, there are two group camping sites with a pit toilet and a site for a tent, but no showers and certainly no toilet paper, so kids, fill your backpacks with leaves. Pro-tip: Maple are generally softer but sycamore tend to be a little stronger. One of the most organized campgrounds you'll see in Indiana is Yogi Bear's Jellystone Park of Bloomington. The RV/camper section definitely geared more toward a resort rather than a camping site, since the spots are situated around a swimming pool with colorful slides and a pool house. The Bear's Den is Yogi's special cabin, and if you wait, he'll come out to say hi! A little farther away in the wooded area are tent camping sites with electricity, and some primitive sites where you'll need to bring everything including toilet paper unless you're a fan of leaves. Also available are cabins of varying sizes and amenities, as long as you're planning a stay that is two nights or longer. Just off the highway near the top of the state sits a family-owned and operated campground and RV park that's been going strong since 1968. It's so much more than a campground, it's a leisure park. Campsites for tents as well as parking places for RVs and pop-up campers, plus cabins, sit near a laser-tag arena and a roller rink for those who like indoor sports. For the outdoor lovers, there are hiking trails and fishing spots, as well as snowmobile paths for winter campers. According to the Google reviews, guests have been most impressed with how hard the staff work to give campers the best experience, so if customer service is a selling point to you, then Eby's Pines definitely deserves a place in Indiana's 10 best! Much more than a campground, Manapogo Park in the extreme northeast corner of the state is seasonal resort where you can lie on the beach of Lake Pleasant, take a boat ride or fish, stay in either your RV with 50 amps of power or one of two rustic cabins or your tent (they do have a few primitive camping sites as well), and engage in the fun activities the park has planned to make your weekend a fun-filled one. There's a playground for kids including the SS Manapogo, a miniature pirate ship “crashed” in the middle of the playground. Argh, matey! Well away from the noise of the city and its roads around a small lake sits a seasonal camping spot for tents, campers, or cabins. The cabins border on adorable due to their size comparable to that of a playhouse that can sleep three to five people cozily, but they're clean and air conditioned with mini fridges and coffee pots. One is accessible with a ramp instead of steps. For a small additional fee, you can also bring your pet to stay in the cabin with you. Their website recommends that you consider a stay during the week when tourism is at a low and things are quieter, and the limited-stock grocery store is less likely to run out midway through your stay. Fox Lake is open seasonally and you can register on their website for a season, a week, or just a couple of days. Formerly known as Last Resort RV Park and Camp, Brown County KOA is located in Nashville, Indiana, one of the most beloved places in the state. Most are familiar with shopping in Nashville during the day and hiking in the evening ending with a campfire at night, but Brown County KOA makes it possible to make a weekend out of it! RV spots face the woods, cabins have free Wi-Fi and cable television, and pets are welcome! Going off-grid for the weekend to reconnect with nature? You can walk the trails located at the campground itself or hop on over to the state park and take one of the hiking trails there. Afterwards, sit a spell in the lounge after buying a snack in the camp store, then pick up some firewood for your campfire. For excellence in customer service as well as extensive amenities, Grandpa's Farm is among the very best. The staff go above and beyond to provide you with the finest camping experience you could ever want, keeping clean bathrooms and shower rooms and also making your pet's stay more comfortable as well! The jungle gym on the playground will keep your kiddos busy and there's a heated swimming pool with diving board for you. For the end of your nature day, there's a fire ring at every campsite and there is firewood for sale in the camping store along with a limited grocery selection, but you're only a short drive away from civilization in case you forgot the paprika.